Gay Key West, Florida Welcome to the Key West Business Guild website where you will find information on our fabulous gay-friendly island: how to get here; where to stay; what to do on the land or on the water; our delicious dining and eclectic shopping options; famous events and renowned nightlife. We make it easy to find a luxury hotel, intimate inn or relaxed guesthouse whether you are looking for exclusively gay, lesbian, or all-welcome accommodations. Key West provides a beautiful and unique venue for weddings and commitment ceremonies. Key West is also home to the Nation's only Gay and Lesbian Historic Trolley Tour. This private charter tour runs every Saturday at 11 am. Read more about the tour here. 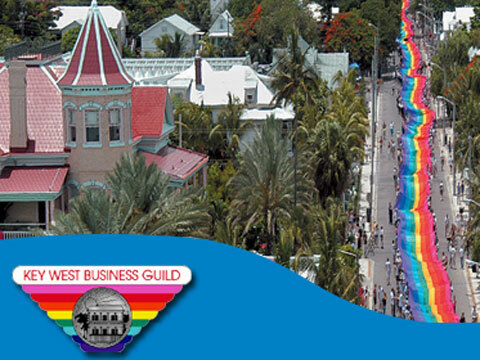 You can also stop by the Guild's GLBT Visitor Center for all Key West information and special coupons and discount offers. The Center is located at 513 Truman Avenue, behind the Duval Street Denny's, and it is open 9 am to 5 pm seven days a week.